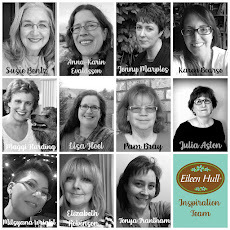 For the next two weeks of October - the members of Eileen Hull's Sizzix Design Team are making cards using her dies and embossing folders to show that Eileen's dies are not just for making 3D items! 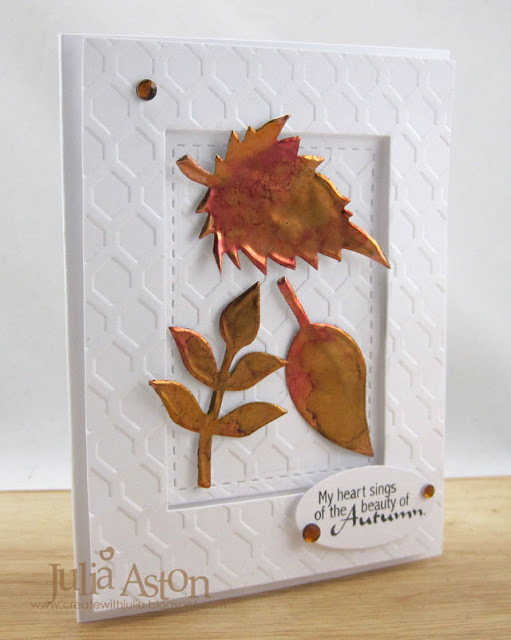 Today I have a card that I made using Eileen's Spring Leaves Die and her Honeycomb Embossing Folder. First I embossed a white panel with the Honeycomb folder, then I used a stitched edge rectangle die to cut out the center . I adhered the inner piece to the card base. 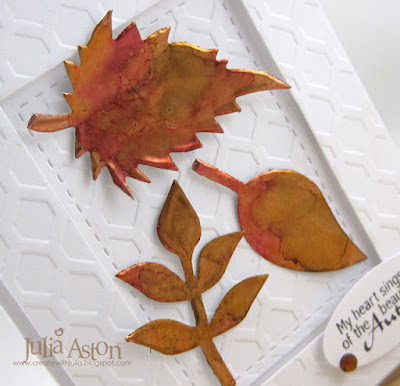 Then I die cut the Spring Leaves out of a piece of Brushed Copper metal sheet. I colored the leaves with Adirondack Alcohol Inks - using Butterscotch, Cranberry and Lettuce. I layered the leaves onto the center piece on foam dots. Then I adhered the outer frame on thick foam dots so it sits higher than the center piece. I stamped a sentiment on white, punched it with an oval punch and layered it over the frame with foam dots. I added 3 rhinestones for a little extra bling! 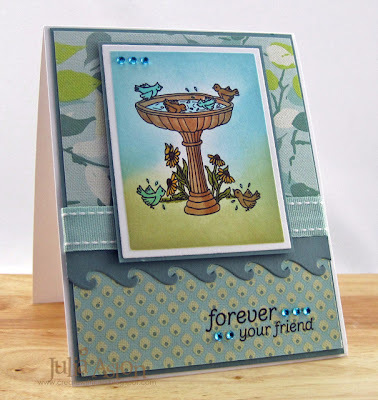 Please be sure to check out Eileen's blog to see how you can use her dies to make cards - I think you'll be inspired! 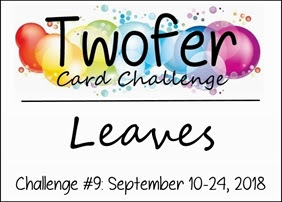 I made today's card for the Cas-ual Fridays challenge - to use fall colors and at least one leaf. 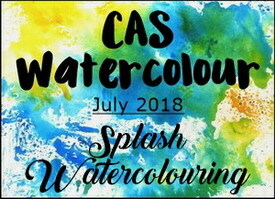 and here is my CAS card - using fall colors of orange, red and green and exactly ONE leaf! 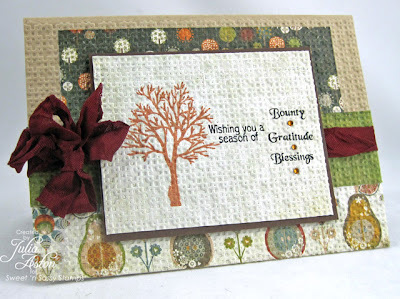 My sentiment and leaf stamp are from Seasons of Change by Sweet 'n Sassy Stamps. I used the matching leaf die to cut the leaf. I stamped the leaf using red, green and orange and also sponged the edges to give it a little more definition. It's popped up on foam dots. I added some enamel dots and drew a border with my brown Micron 01 fine tip pen. 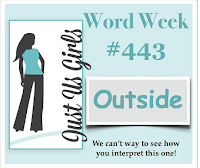 I'm also entering this in Word Art Wednesday - Anything Goes. Ink: Memento Lady Bug, Bamboo Leaves, Tangelo, Versafine Vintage Sepia. Accessories: enamel dots - My Mind's Eye, foam dots, brown Micron 01 Fine Tip pen. I wanted to share a couple of cards I recently made using stamps from Sweet 'n Sassy. 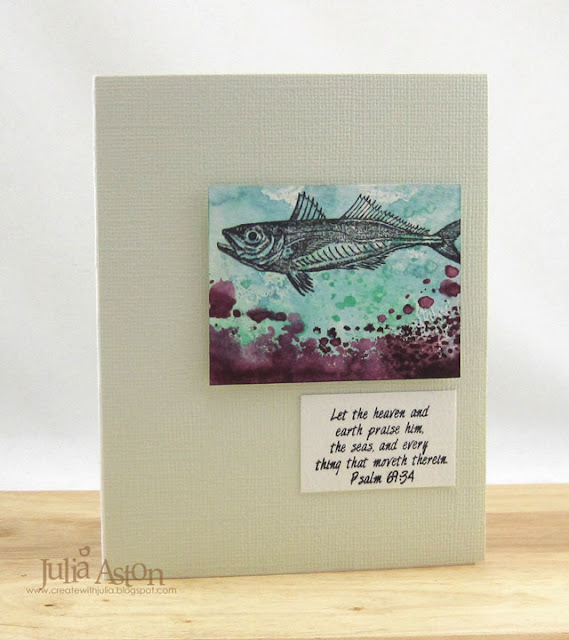 My 6 month term of being on the SNSS Design Team is drawing to a close and I have greatly enjoyed using Korin's lovely stamps and sentiments on my creations. 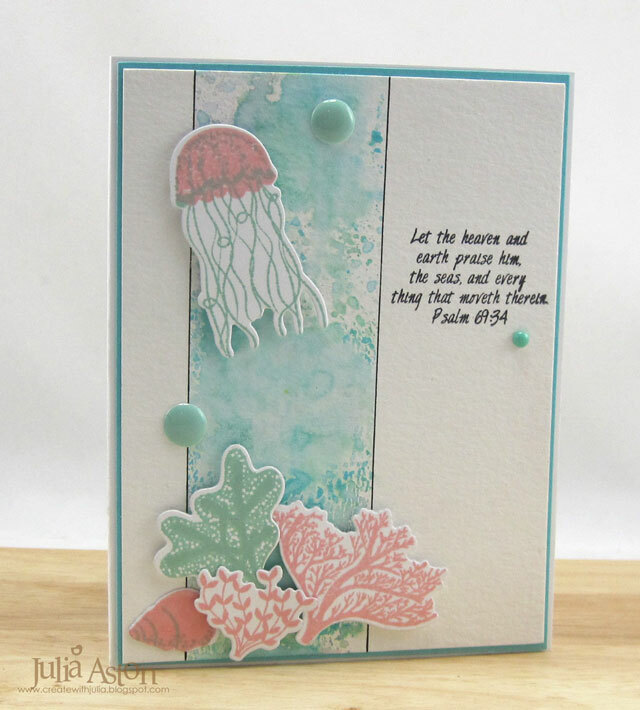 This card was made using a recent Split Coast Stampers sketch. 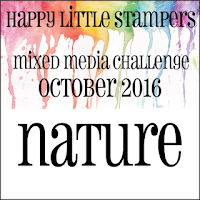 The stamps are from Forest Silhouettes and Autumn Bounty. I used the Square Lattice embossing folder from SU on both cards. I love the texture it gives to the cards. 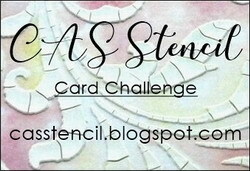 I made my second card for a recent SCS Inspiration challenge. 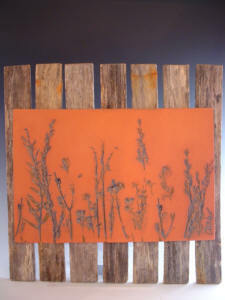 This was my inspiration - a wall hanging from the Handscapes Gallery web site. 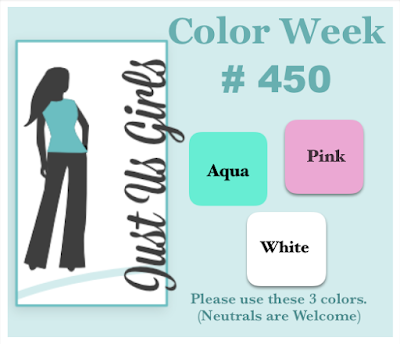 and here is the card I created using Serene Silhouettes and Seeing Spots. 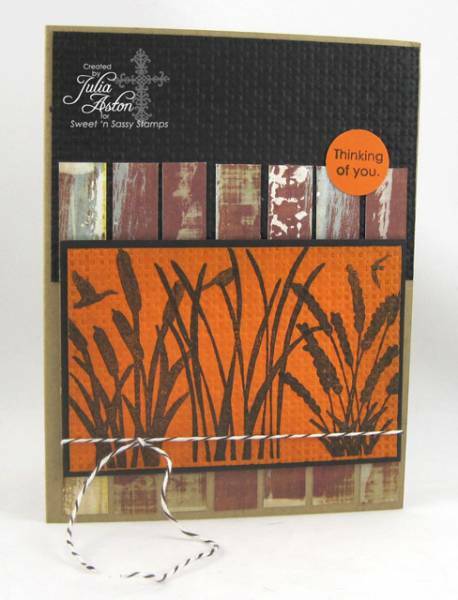 The background strips are pieces of weathered wood grain patterned paper by Fancy Pants. 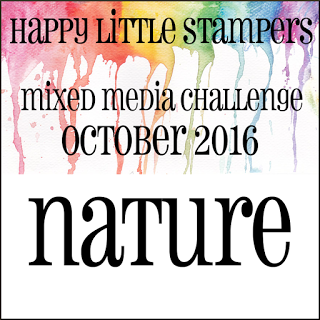 Hope you are having a happy stamping day! Oh - and just looking ahead - The Waltzingmouse Design Team will be having a Stamp of Approval Parade Nov 1-4 using prior release Christmas stamp sets - so please stop back then for lots of holiday inspiration!! Sweet 'n Sassy Meets the Twinery - Blog Hop! Today I'm excited to be participating in the Design Team blog hop between Sweet n' Sassy Stamps and the Twinery! You should start the hop at The Twinery if you came here from Tifany DeGough then you are in the right place! See below how you can have a chance at winning a prize! 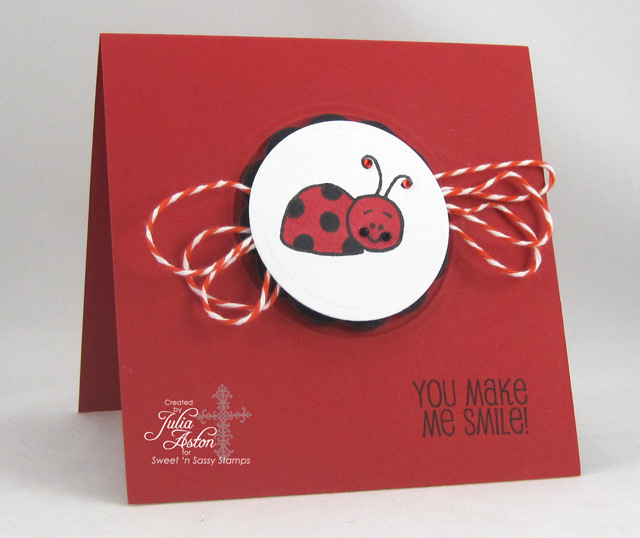 This little lady bug makes ME smile - isn't she the cutest! I stamped her on white, die cutting with a circle Nestability. I colored her with Copics and added some tiny twinkles to her smile and antenae! I wrapped the twine to get 3 loops on each side, then adhered it to the back of the lady bug circle. I layered that to a black scallop die cut circle. I embossed another circle on the card and layered the image onto the frame with foam tape. I thought the loops of twine gave the impression of wings, although I didn't try to make them even or in a straight line. Then I simply stamped the sentiment directly on the card. 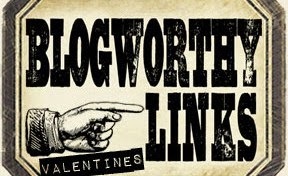 So here are the details on how and what you can win! 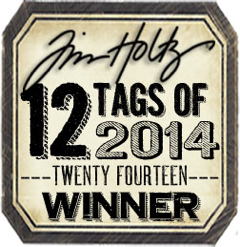 There will be TWO prizes awarded from those who leave comments on all participating blogs. 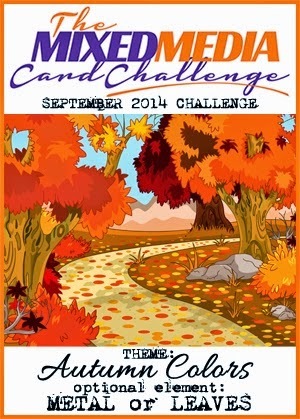 Winners will be announced at the Sweet 'n Sassy Blog and The Twinery on Sunday, Oct 23rd. 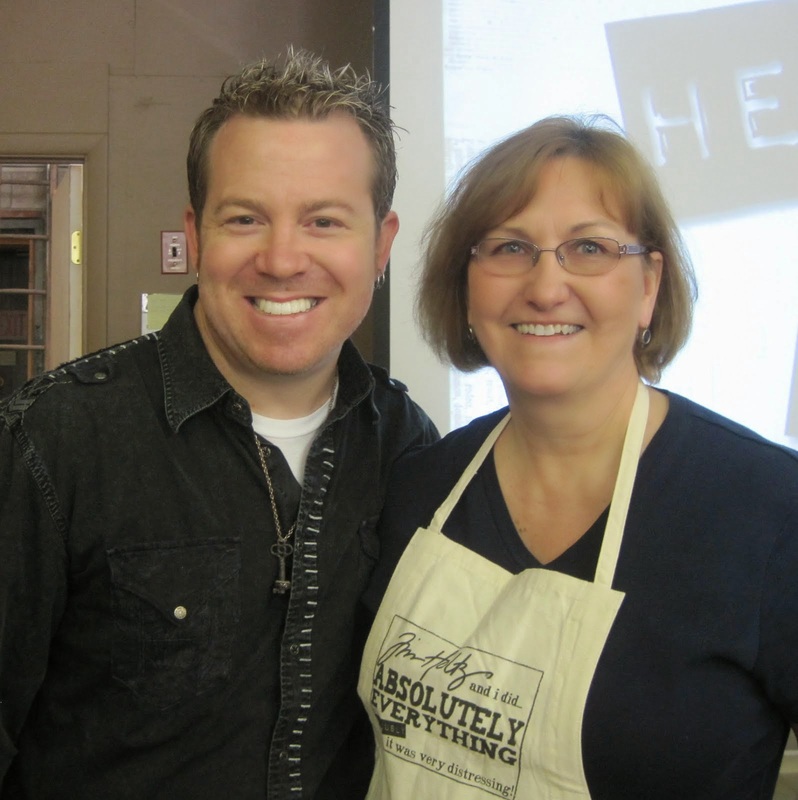 Thanks for stopping by - and Good Luck! Accessories: Copics - R37, 100, Mandarin Bakers Twine - The Twinery, tiny twinkles - Taylored Expressions, circle and big scallop circle Nestabilities, foam tape. Thanksgiving Blessings and Fanged Pumpkins! 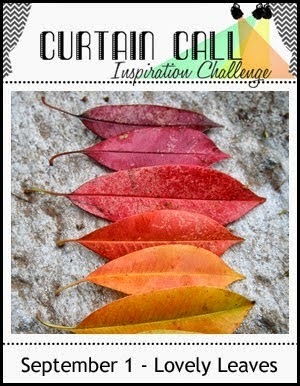 I made this pretty fall card for the Color Challenge over on Split Coast. 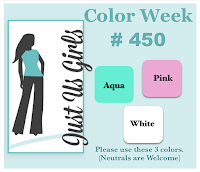 Betty's challenge was to use the SU colors of Pool Party, Cherry Cobbler and Early Espresso. I didn't have those exact colors - so I used Pool Party (the one SU color I had) a Tim Holtz Coredinations Walnut Stain for the lacey edge panel, and a Bo Bunny Harvest Dot for the leaves (the back side is plain red). 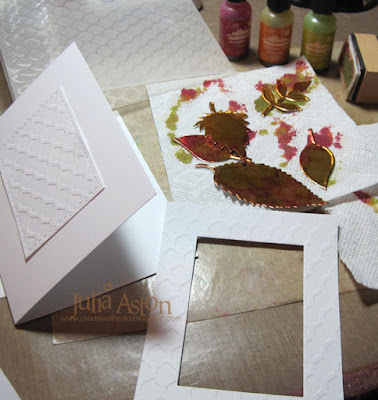 I used my new Sweet 'n Sassy leaf dies to cut my leaves - so easy peasy!! 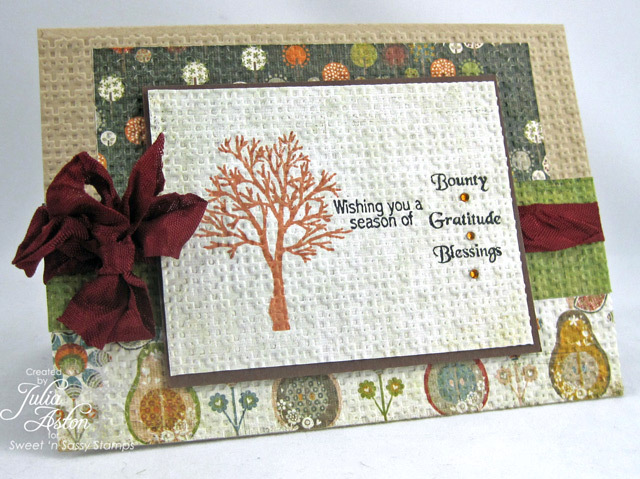 I stamped the sentiments from Autumn Bounty right on the leaves and added a little bling to accent them. Don't these just CRACK YOU UP!?!? 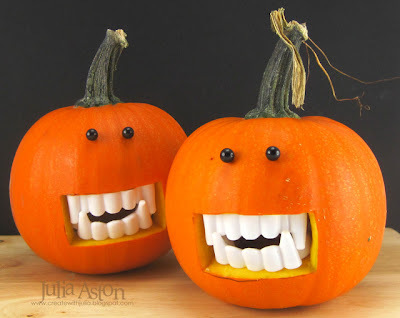 Martha used little white pumpkins and red map pins - but all I could find right now were little orange pumpkins - I got the teeth at a seasonal Halloween shop - they were just 15 cents a set! I don't know how long they will last once you cut them but I'll be making more of these for sure! We're celebrating my son Joshua's 34th birthday tonight and I'm going to have these little critters as the centerpiece on the table! Paper: Pool Party - SU, Cordinations Tim Holtz Walnut Stain, Kraft and Dark Chocolate - PTI, Bo Bunny Harvest Dot. Accessories: Foam Tape, square lattice embossing folder - SU, leaf dies - Sweet 'n Sassy Stamps, tiny twinkles - Taylored Expressions, lacey punch - Martha Stewart. Hi friends! 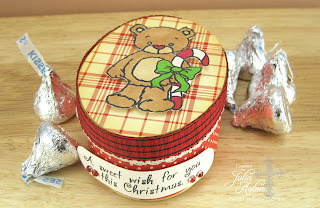 I'm sneaking in to let you know I've got a post on the Sweet n' Sassy blog today of this sweet little Christmas Treat box. I used the cute set called Rhubarb's Christmas. 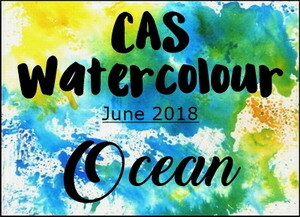 I'd love to have you check it out over there - there are more pics and details on how I created it! 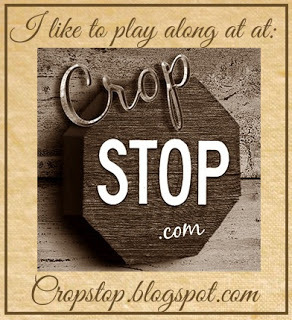 I'll see you at 2 pm EST for the WMS Sept Release Blog Waltz! 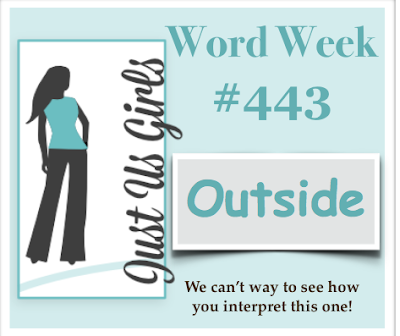 Sweet 'n Sassy Sweet Peek Day #4 - Jolly & Sweet! Hi Friends! 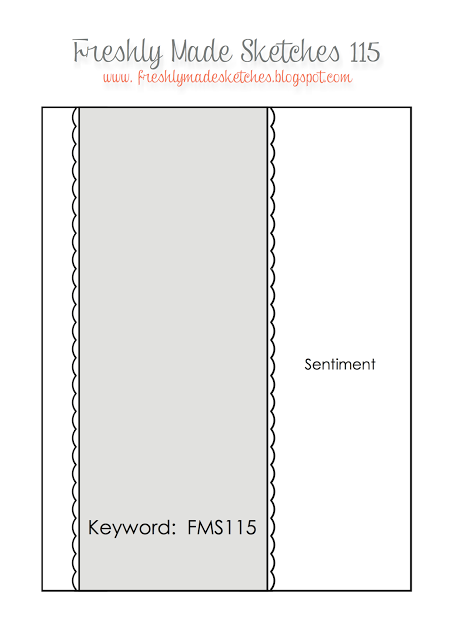 are you loving Korin's Sweet Peeks so far??? You can see all of them over at the Sweet 'n Sassy blog.... Today I have a card using this fun new snowman/Christmas set 'Holly Jolly Christmas"
This weekend I'm busy, busy doing a major cleaning at my home - my stamping/blogging friend - Charlene (Lilluvsstampin on SCS) is traveling from Michigan to Boston this week and will be staying with us for two nights! whoo hoo!! Nothing like having company to get you inspired to clean up!! "On September 7th, 2011 much of Eastern PA experienced major flooding due to continued rain over the course of several days. One of the communities affected by the flooding is my home town of Pine Grove. I grew up in this small rural town and it is very near to my heart. Many of my family and friends still reside there. My heart broke as I saw the devastation of the flood waters to this small community. Many homes and businesses have been completely destroyed and the clean up is sure to take months if not longer. I am burdened to help out in any way that I can, so I have designed this stamp set in honor of my home town, Pine Grove. I drew the "pine grove" image in honor of the town's name and I came up with the sentiments as I pondered what I might say to the flood victims....many of whom are my friends and family. " All proceeds from the sale of this set will be donated to the Pine Grove Disaster Relief Fund & the Operation Hugs & Kisses Organization to help the many, many flood victims of Pine Grove. 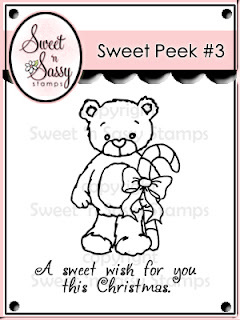 Sweet 'n Sassy Sweet Peek Day #3 - A Sweet Wish for Christmas! 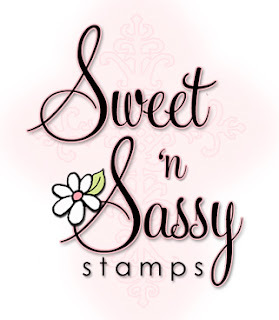 I'm excited to share my card for Sweet Peek Day #3 of the September release of Sweet 'n Sassy Stamps! 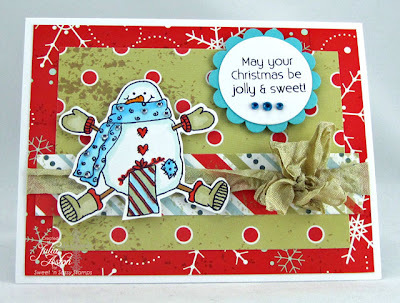 Korin has created a wonderful Rhubarb's Christmas stamp set for us this month! I used Rhubarb holding a gingerbread man cookie from this set and layered him over my die cut gingerbread man! I wove together two pieces (red and white) of jumbo rick rack to make my 'candy cane pole'. Because my card is black - I lined the inside with a slightly smaller white card base - which allows me to stamp a sentiment, sign the card - and also covers the ends of the rick rack! Taylor, Bridget and Jessica who are also showing Sweet Peeks of Rhubarb's Christmas set today! I'll be back tomorrow with another Sweet Peek so I hope you'll stop by! 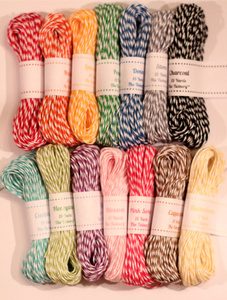 Paper: Tan Bazzill, White & True Black - PTI, DP Bo Bunny Harvest Dot. 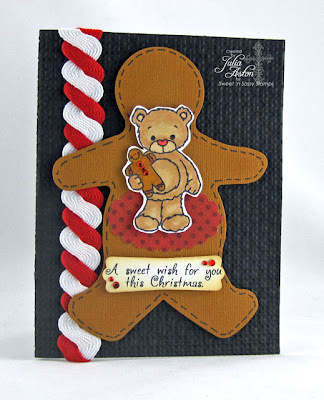 Accessories: Scor Tape, foam tape, glue Pen, jumbo rick rack -Wrights, Square Lattice embossing folder - SU, gingerbread die - Tim Holtz Alterations, black gelly roll pen - Sakura, Copics E33, E35, E53, YR24, 100, R14, Modern Label punch SU, scallop oval punch - SU, rhinestones - Kaiser, tiny twinkles - Taylored Expressions.